Engine is as yet uncommisiioned and warranty begins from first use. Note: Offers on the asking price may be Brokers comments, Sunrise aluminium boats. 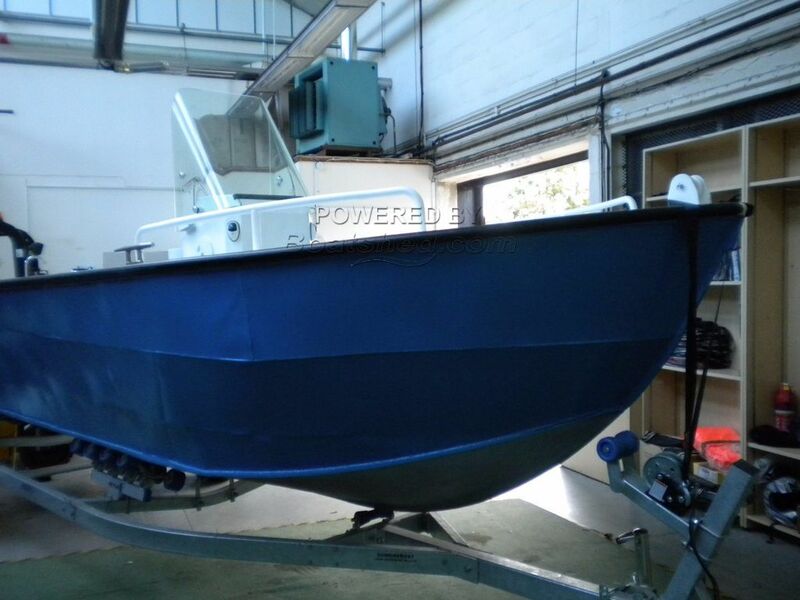 This boat has been manufactured in China with an intended use as pleasure/fishing boat, however I think that it might also make a very useful work boat, possibly for a marina. Of aluminium construction, it appears to be built to a very robust and strong specification, however some of the hull panels have distorted a little under the temperatures of welding, as can be seen in the photos. The boat is not completely fitted out but the control systems and wiring are in place in readiness for an engine to be fitted. The design is intended to take an engine of up to 150 HP and the engine shown in the photos is currently not connected. It's brand new and the owner has assured me that the warranty can be initiated by the new Owner from the date of commissioning. The trailer is completely galvanised and because it has been stored indoors appears in showroom condition, as does the boat. The helm has a wrap-around glass screen that would offer great weather protection and looks very good too. There is an identical boat also for sale (painted red) which can be purchased through separate negotiation. This Sunrise Fish/work Boat has been personally photographed and viewed by Steve Hammond of Boatshed North Devon. Click here for contact details. Please note this comments section is public. Please do not post your personal details here. To enquire about purchasing this boat, please contact the broker directly at stevehammond@boatshed.com. Please read our commenting guidelines before posting.